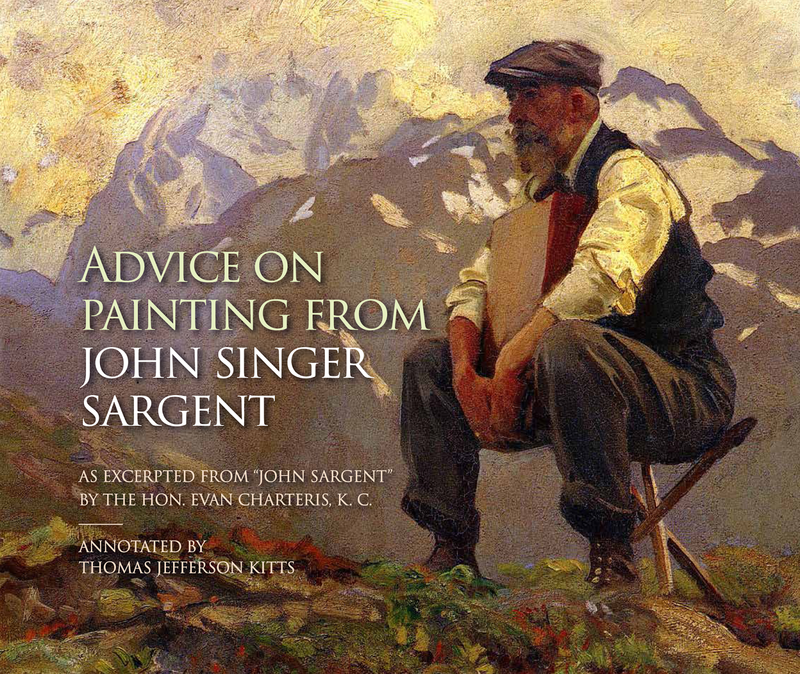 Thomas Jefferson Kitts | Blog: Saving Paint . . . Saving Paint . 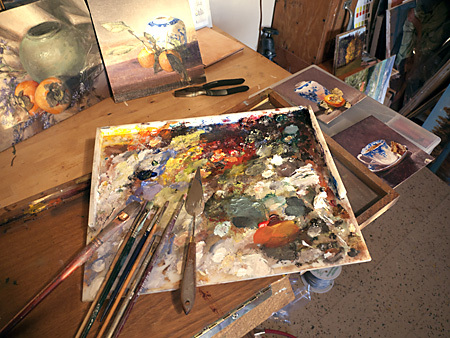 . .
Every oil painter is keenly aware of the cost of good paint, and that awareness often prevents us from squeezing out what we need, which often results in a starved or anemic looking painting. 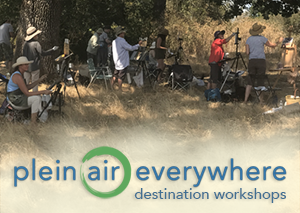 It is especially hard to lay out out a generous amount of paint towards the end of a session because all too often, the color we find ourselves running short of is one of our more expensive ones. You can put your palette in the freezer. "But won't this hurt the paint? Curdle it like milk?. Ruin my masterpiece for the ages?" – I hear the Painters for the Ages muttering. Nope, it won't. 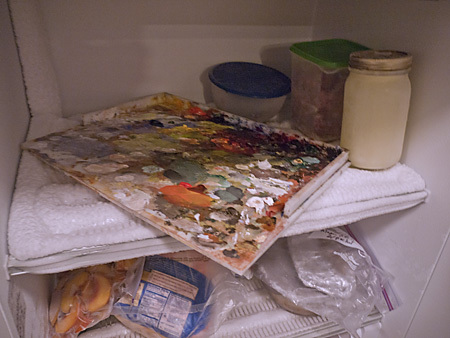 Oil paint doesn't freeze until –4 °F (–20 °C), and I hope you haven't set your freezer that low. If you have, you're wasting electricity. Turn it up to 0 °F (−18 °C) That's your FDA-approved setting for frozen food. "But what about the condensation. What about freezer burn?" -- again the Painters for the Ages mutter. Just take your palette out and allow it come to room temperature. Shouldn't take much longer than five to ten minutes. Any frost you see will melt and evaporate off. Chillax and get your morning cup of coffee. Let the dog out for that much needed potty-break. Take one yourself. By the time you get back to the studio those frosty looking colors will be nice and juicy, waiting for you to dip in and spread their yummy deliciousness around. They'll act like they never got iced. "Okay," the Painters for the Ages acknowledge. "How do you know doing this is okay?" Simple. I asked the folks who make our paint. A number of them. And I asked a few conservators who repair paintings. Everyone concurred so long as the paint doesn't actually freeze (–4 °F ) In fact, back in the day, when the Old Masters had apprentices mulling colors for the day, they'd submerge a palette under water to save all that hard work for the next. Apparently, being a cheap as an artist ain't new. Anyone surprised? So, if you want to continue wasting paint then ignore this tip. But you like the idea of being able to feed your ROTH IRA or 401k plan more aggressively -- then try icing the palette at the end of the day. Every oil painter I've shared this trick with has been amazed at the results. And most of them are still doing it. But there is one caveat to remember: If you use a drier or accelerant in your mixtures, putting the palette in the freezer won't slow the 'drying'* down. (See below) Of course, if you are adding such things you probably aren't painting for the ages anyway, eh? *So why do I keep surrounding the word 'dry' with quotation marks whenever I talk about oil paint? Because oil paint doesn't really dry in the way the term is normally used. Not like a watercolor or a rain puddle dries. In an artist's 'drying' oil there are long chains of fatty acids called polymers and they link themselves together by pulling oxygen out of the surrounding environment, and so the fluid nature of the oil transforms into a durable film of Linoxin. It would be more accurate to say an oil painting cures, but most people still call it 'drying'. (Admittedly, this is a very simple explanation for what occurs, and much more actually goes on during the process, but this explanation should suffice for now.) Slowing or stopping the oxidation by reducing the surrounding temperature is what keeps your color mixtures fresher longer. I've been freezing my paint for several years, works great! Thanks for the seconding, Debra. At the risk of sounding a tad pedantic, I want to underscore the point that I don't "freeze" the paint on my palette. I put it in the freezer at 0 degrees F.
I assume you don't freeze it either, right? That would be bad. I've been doing this for some time too. I use a Masterson box which covers the palette so food doesn't bump into it. That is a fine idea. I looked into using a Masterson box myself but my present palette is too large to fit into the ones I cold find. I don't put mine in a box. I used to cover it with plastic wrap to keep the food clean (and safe). But about a year ago I got a new frig and relegated the old one to my studio. So now my palette has its very own storage freezer, and I don't have to cover it anymore. I was kind of concerned about not covering it, but I thought I'd give it a try just to see how it worked out, and it didn't seem to make a difference either way. Wrapping your palette is certainly another way to prevent oxygen from reaching the paint, and thus slow the 'drying' in an additional way. But I wouldn't like the amount of plastic wrap I'd be using over time. I speculate that if you were to test wrapping your palette, and leaving it out in your studio, vs wrapping it and putting it into your freezer, you'd find there is little difference in dry-time, since oxygen is prevented from reaching the paint by the wrap. (This is the reason oil paint does not dry in a metal tube and will last indefinitely unless uncapped.) I'm guessing that the big difference would due to the wrap and not the temperature. Perhaps you'd like to perform a little comparative test and report back to the rest of us to confirm this? I'd love to know what you find, and would happily report your results on this blog.